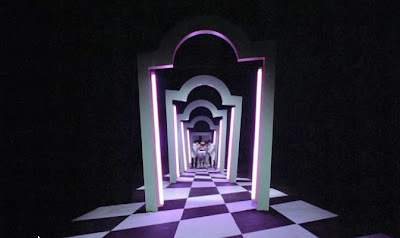 After finally purchasing Suspiria on DVD I was thrilled to get the chance to shoot some spectacular screen shots of my favorite film. Unfortunately, brand new packaging and all would not prevent a tiny piece of whatever it was that got stuck inside the lens during manufacturing. It would not play past the "WARNING" message on my laptop, but would play just fine in my regular DVD player. In a desperate attempt to win back the ability to take screen shots, I ordered the movie from Netflix. 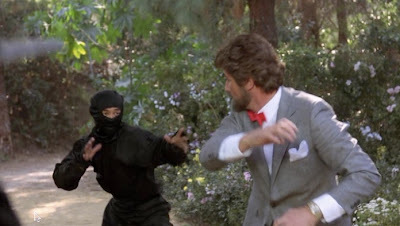 LameFlix however does not have the two disc restored edition and the picture quality was absolutely dreadful. This made me want to cry- but then as I continued to watch I became suddenly interested in something I had heard about but never investigated. 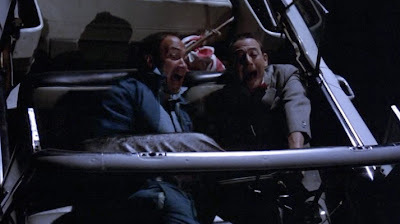 The occurrence of a strange "ghost" reflection that happens in the taxi cab with Suzy, at the onset of the film. After careful shot by shot analysis, I finally found the ghost face and my blood instantly froze. Then upon even further investigation I found MORE hidden surprises, each of which filled me with more fear and an even greater sense of appreciation. 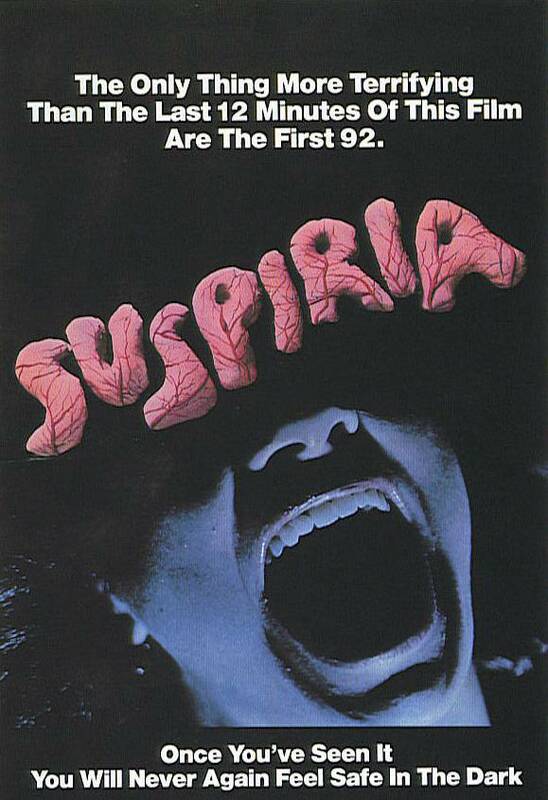 I first came across this after reading the viewer comments on Suspiria part one on Youtube. 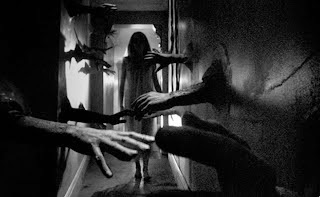 In it, someone exclaimed that they were freaked out after seeing what was described as a ghost face that "WAS NOT SUZY". The viewer gave a time point of 3:28. I frantically played the clip over and over again and was pissed that I could not see the damned thing. 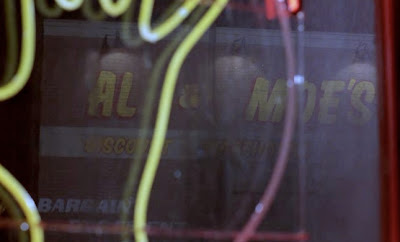 This more recent viewing of the film however, I was determined to find this ghost. The key to seeing it, is to look at the back of the driver's neck, and I would also suggest looking closer to 3:31. The first thing I saw was the teeth of the girl, and once I found that I was terrified. It's very clearly the face of a woman. 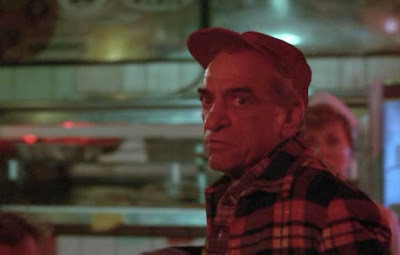 Some even say this face resembles that of the scream on one of the covers of Suspiria. What it is has never been explained, but one thing remains true--when you find it, it instantly sends shivers down your spine. I've always wondered what that random shadow in the woods could be. I've searched message boards far and wide to try to come up with a plausible explanation. I've heard--camera equipment visible, tree branch, even "quivering rabbit" but nothing seemed right. I was starting to get hopeless and began wondering if this shadow would turn out to be like the hanging munchkin in the Wizard of Oz. It would be nothing, a minor glitch in the larger schemes of things. But then someone suggested something that was so obvious, that I couldn't believe I didn't see it sooner. The shadow, when looked at the right way is actually a razor blade. The same razor blade I think, that is later used to kill Sarah. This one actually works better if seen in actual video form (go to 5:05), because the shadow moves in such a way that it does look like someone is actually holding the razor blade. In the 2nd little burst of the shadow, you can just barely make out what even looks like someones knuckles. I'll admit this one may just be a describe that cloud kind of game--but you must admit a razor blade is the best argument we've got. This one I came up with on my own and may very well be completely bogus--but I will maintain that there is something incredibly eerie and unnatural about the way Pat's shadow enters the scene. 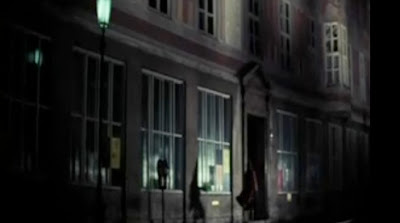 This is when we see Pat Hingle approaching the hotel/boardinghouse/ place whatever it is. We first see Pat approaching at a bit of a walk/run. At first it seems as though her shadow should be in the picture sooner than it actually appears. Then out of nowhere her shadow comes screaming (or flying?) in at about 7:20. I realize this is probably not on purpose, or that it's just simply how her shadow would like according to scientific explanation--but you can't deny that there's something strange about it. It almost looks like her shadow is someone else chasing after her with their arms open- before joining her as her real shadow. 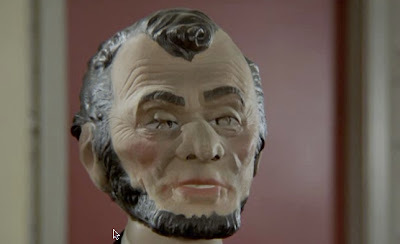 I still maintain that it's one of the creepier things I've ever found. This is one that I definitely would not have noticed had it not been for the special features disc that thankfully did work in my disc drive. 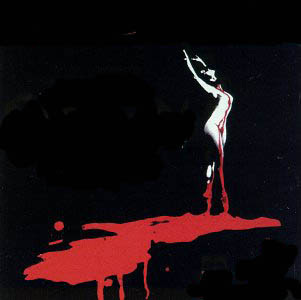 Apparently in the stunning red of Pat's blood is the picture of a stereotypical witch on a broomstick. It's quite easy to see once it's spelled out but seriously, how cool is that? These are the kind of things that make me open my eyes in wonder at the film as a whole. If all these things can happen in the first 10 minutes or so--what else can we explore in the movie? Unfortunately due to either laziness- or the impending doom at how awful the color was on this version, I couldn't find any other hidden trinkets. 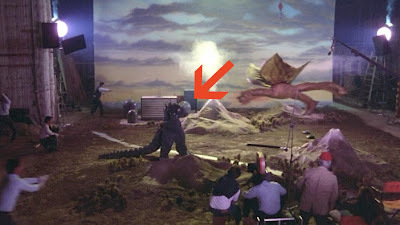 Perhaps there was only this small number in the film's first few minutes- or maybe the others take a much more trained eye to catch. In any case once I somehow claim a restored version that does play in the disc drive, you can guarantee that I'll be on the hunt. 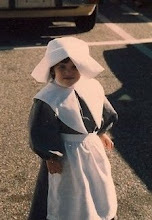 A witch hunt! Just kidding..
3:31 for the ghost in the cab. 5:05 for the razor blade shadow on the tree. Pee-Wee's Big Adventure is one of those rare movies that is, dare I say it?..... Perfect. It's Tim Burton before he became unoriginal. It's Danny Elfman without synthesized children's voices. It's Paul Rubens at the high point of his career. And most importantly it's funny as hell. I timed myself and I laughed for about 98% of it. The other 2% was spent crying over the scary clowns in the scary clown dream. When else does this happen in your life? I'm stumped. 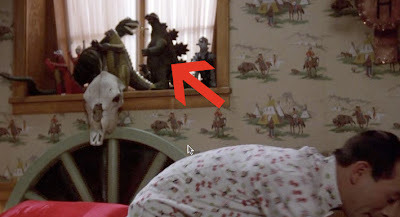 Let us first take a look at part of Pee Wee's bedroom. It is decorated, as it should be with randomness. One thing that I never noticed however was that scary doll riding what can only be described as a possessed ostrich. Those glowing eyes don't fool me! What is that though? If you were searching for the subtle creep factor that is early Tim Burton, look no further than that ostrich and the thing riding it. 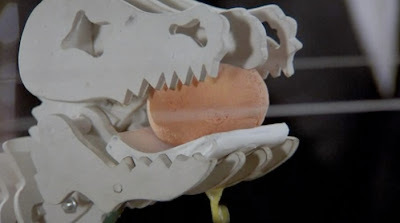 One of my favorite parts as a kid was the intricate breakfast making sequence. On this watching however, I came to love other things such as the dinosaur that squeezes the orange or should I say--Nerf ball. AKA the worst fake orange I've ever seen. 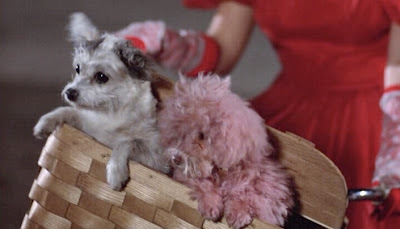 Emmy Doomas and I have had lengthy conversations on how aggravating it is to watch that entire breakfast machine breakfast happen--and then have Pee Wee eat 3 bites of Mr. T cereal, wipe his face and leave! 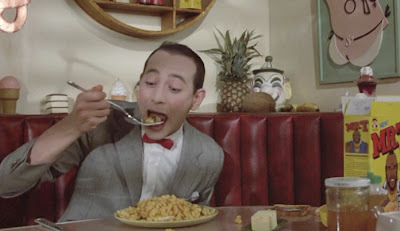 This travesty however is redeemed by Pee Wee's large eating utensils. 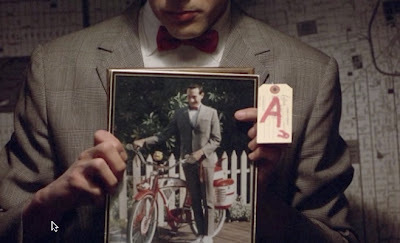 Time to unveil the majestic-ness that is Pee Wee's bike. A bike so coveted that the richest kid on the block can't have one for himself. 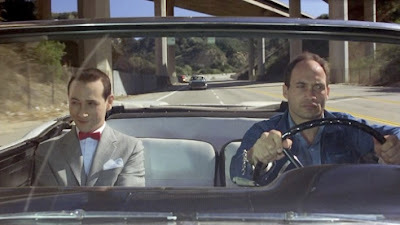 In the hopes of buying Pee Wee out or perhaps just nagging it out of him-Frances and Pee Wee embark on what can only be described as the greatest exchange in the history of the world. 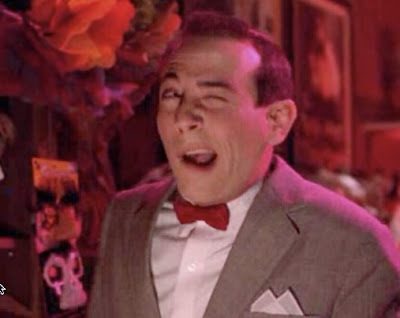 YOU'LL BE SORRY PEE WEE HERMAN! Or will he be too busy pulling off some of the raddest tricks on the block? 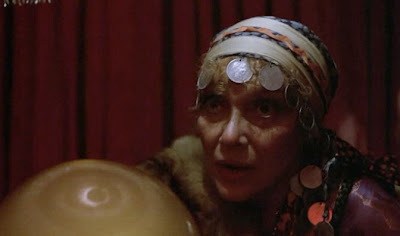 Time for a trip into town, and what I find to be one of the most disturbing things out of the whole movie. Lalalala here we are at the mall. Oh right time to lock up my precious bike next to the SCARIEST CLOWN STATUE thing I've ever seen that also MOVES! 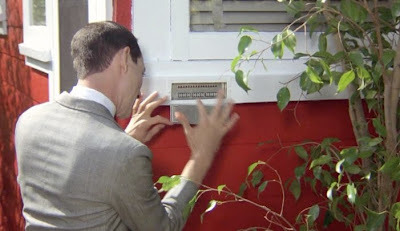 Honestly, Pee Wee is far too trusting sometimes. I'd take a regular old bike rack over this guy any day. 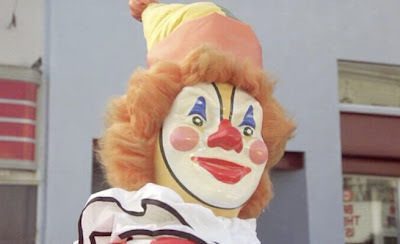 You can just tell he's not a trustworthy clown, and his hair is kind of gross and dirty. 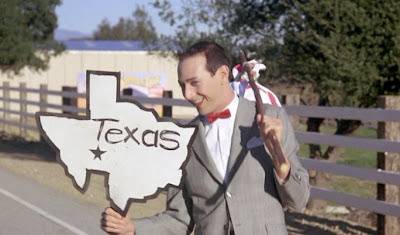 What was Pee Wee thinking? 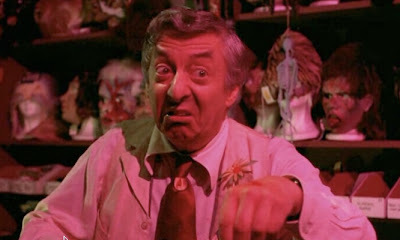 Luckily this clown doesn't get really scary until later, and while we wait for that to happen we are treated with Pee Wee's shopping trip at the magic shop. 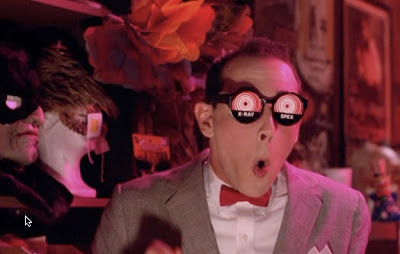 The best part is how creepy and un-talked about the part where Pee Wee puts on the X-ray specs is. 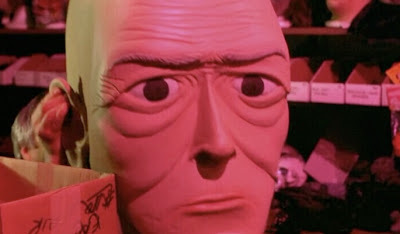 How was I not severely creeped out/turned completely off from this movie when I watched this as a young one? Yikes. Oh well, time to get busy buying magic supplies. What does Mario have for us today? 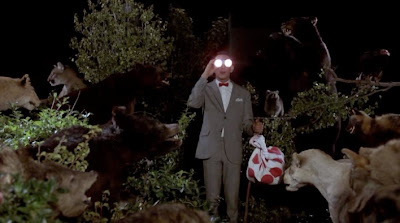 Some headlight glasses, trick gum and a red bow tie later, Pee Wee sets off to pick up his new bike horn from Dotty. On the way back to the bike, we get some startling news. The clown ate the bike! And has turned really evil and really really terrifying! Seriously. That clown is extremely damaging to a young child's psyche. 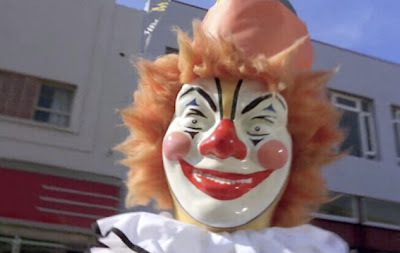 Actually I was just kidding about the clown eating the bike. 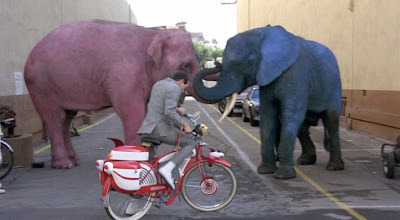 Pee Wee believes Frances took his bike, and after their morning confrontation, who could deny that? Time for some revenge. The problem is- Mr. Buxton is blind to his son's bad side and also the fact that Frances must be at least 35 years old and not 12. 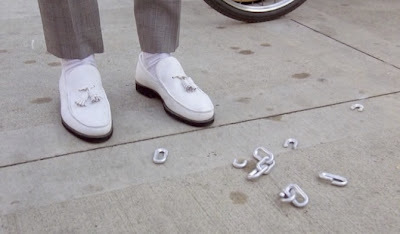 Therefore Pee Wee walks away without his bike and holds an emergency meeting in his basement. 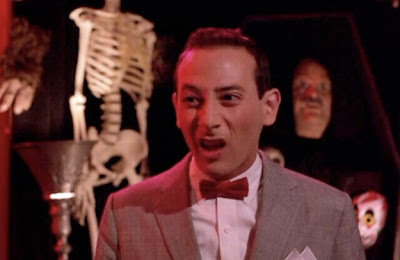 to Exhibit Q, as the basement grows hotter so does Pee Wee's head. It's not long before he goes out of his mind and takes to the streets in an angry attempt at a release. Thankfully he finds a psychic just in time. It's really convenient. Especially in this day and age when lying becomes harder to do every single day. 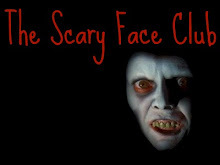 we are finally face to face with what many people consider to be one of their greatest childhood fears and traumas. 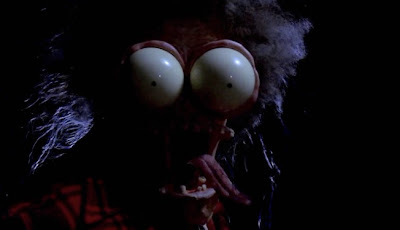 LARGE MARGE. I can't tell you how conflicted I was as a child, because I loved this movie so much but hated, absolutely hated when Large Marge entered the picture. I could never run out of the room quick enough, and to be honest, hearing the scene from afar wasn't that much better. 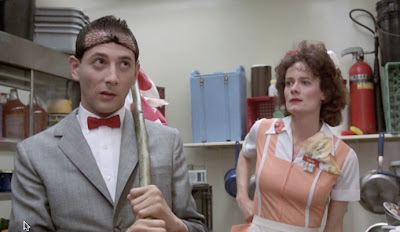 Left off at the diner, Pee Wee encounters some deja vu and we encounter some future glimpses of the janitor from the underworld in Beetlejuice. Fancy seeing you here sir! who I always thought was a man, and I still think that. 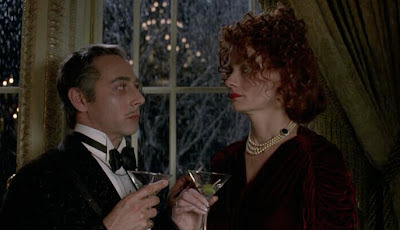 Also, fun fact-- Pee Wee and Simone play Penguin's biological parents in the very beginning of Batman Returns! 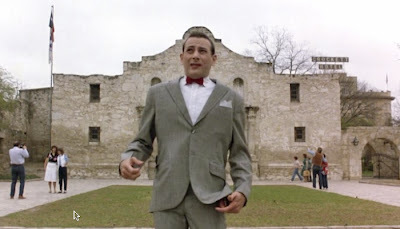 In any case, Pee Wee finally makes it to The Alamo. But. Bad news guys. 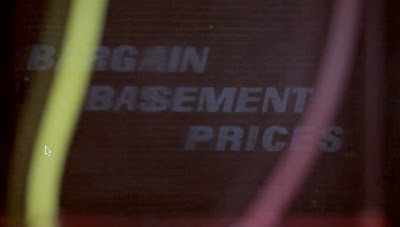 There's no basement in the Alamo!! Time to forget about our sorrows and make friends with some biker gangs. 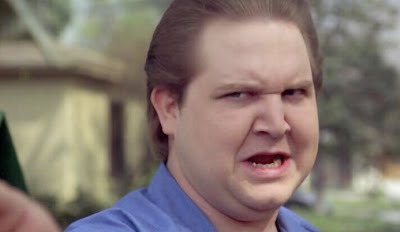 And hey didn't you know that the hot biker chick was really Elvira in a disguise? Ok. Now it's time for something truly disturbing for you to feast your eyes on. The clown dream! I'll understand if you want to skip over this part because it is pretty terrifying, but if you want to be brave like me, then you will face your fears and really try to figure out why this is so scary. First lets start with how things really looked. 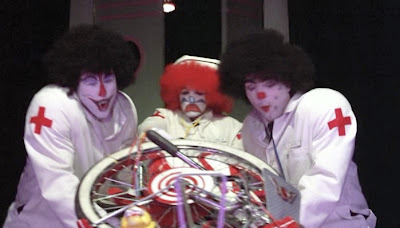 That's right, nurses and doctor's that are not clowns. They say, dreams and nightmares are often created by small parts of our day as opposed to large ones. 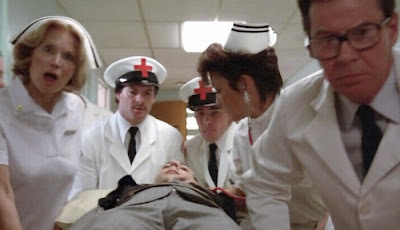 But how the heck do you explain how Pee Wee remembered that these people wheeled him in, while he was unconscious! Yes, that is hint number one that this scary clown dream's origins actually come from the devil and not real life. Ok. I've seen some scary clowns. I've seen fat clowns, klowns that drink blood, clowns that kill people with giant meat cleavers and clowns that are drunk--but I have never, NEVER seen clowns like these. Really, it's very very uncool. I think part of their scare appeal comes from the fact that these clowns don't seem very supernatural. They look as close to a real clown as you can get. Which is of course problematic because real clowns are much more of a threat than clowns that are really aliens. Ya dig? 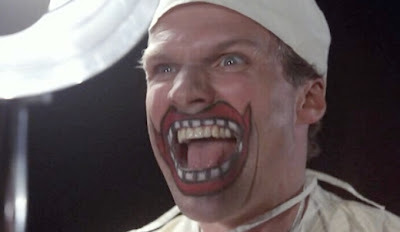 Moving onto the evil clown surgeon, who at first glance does not look like a clown...until he pulls off his mask! I think I screamed bloody murder the first time I ever watched this scene. I was definitely not expecting that at all. 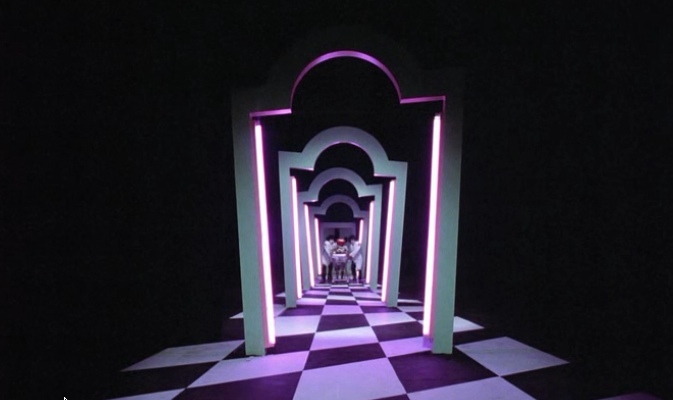 Oh and check out this glimpse into the future underworld of Beetlejuice. 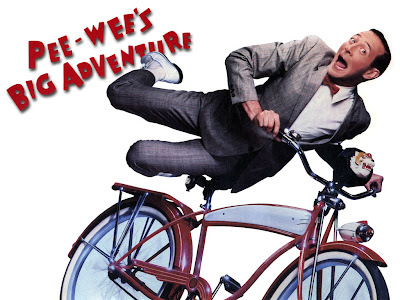 Thankfully Pee Wee awakens from hell and finds himself starring straight at his bike! Well sort of. 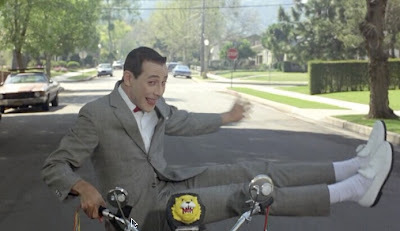 Due to some incredibly perfect timing, Pee Wee learns that his bike was bought by Warner Bros. and is being used at that exact moment in a movie about some nuns. 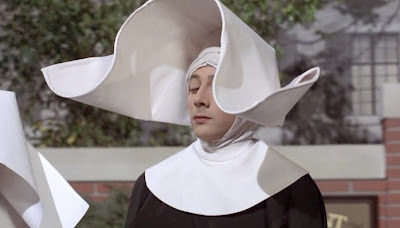 Never one to miss an opportunity to dress like a woman, Pee Wee blends in as a nun. Reclaims his bike! And meets animal cruelty as it's finest. Onto the epic chase sequence through Warner Bros. studio! Someone must love Godzilla....but also, who doesn't? 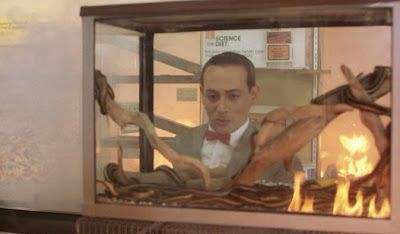 So yeah, Pee Wee escapes the studio and is almost home free till he stumbles upon a pet shop in flames!! 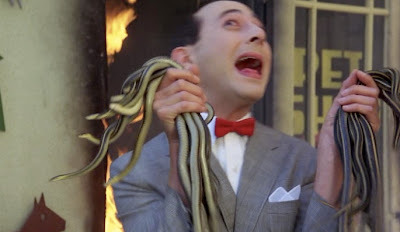 Being the heroic hero that he is, Pee Wee saves every animal inside, even the snakes which he hates! So is he a hero, or a convict? but that is not important. 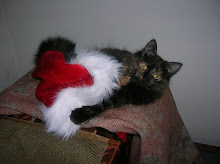 The important thing is that Speck has a new girlfriend. 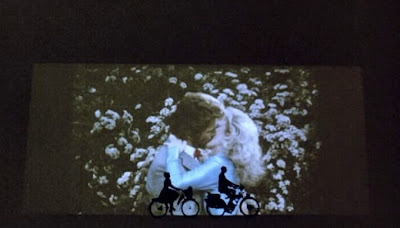 And so we come to the end of yet another fabulous pictorial journey through another fabulous film. 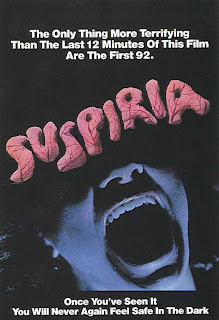 Stay tuned next time when I FINALLY post a tribute to Suspiria. Dependent upon If I ever get a decent copy that works..